Jewelry are the reflection of your personal style and lived experiences. There’s something quite beautiful about looking at someone’s jewelry collection because it can tell you so much about their perception of themselves. Jewelry pieces hold a dear place into my heart for their sentimental value, but also for their ability lift up any outfit. Now more than ever I favour quality over quantity and I’ve also try to keep my collection quite minimal so I can wear the pieces more often. 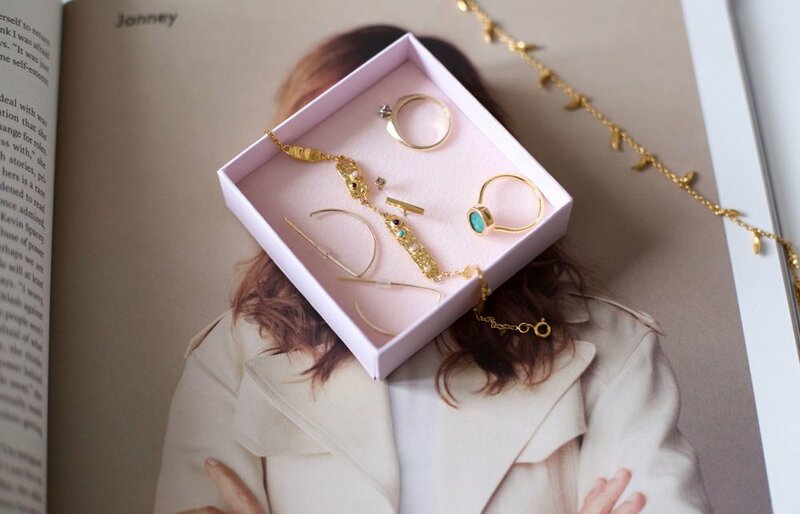 If you’ve read the post I wrote last year about curating your perfect jewelry collection, you might notice that some pieces are not part of my collection and new ones I’ve been added. I think today’s edit is a true reflection of my style and I’m quite happy with how it looks. In terms of earrings, I have something for every occasion. You can see above my beautiful new Dior Constellation earrings, which I plan on dressing both up and down. On an everyday basis, I wear a ‘S’ stud from Catbird on my right ear and a bar stud from Mejuri on my left ear. When I wear buns, I often opt for my thin open hoops from & Other Stories. And other times I will opt for the small COS hoops or the bigger & Other Stories hoops with blue ribbon. I’ve been so impressed with & Other Stories jewelry for their cost per wear. The pieces were so affordable and haven’t tarnished. On my neck, I have to say I’m quite in love with my combo of Lucy Williams for Missoma necklaces. I wear the Fang necklace shorter in the neck and the pendant Roman coin necklace hanging longer. The only way I could make it better is by one day getting the Céline giant alphabet necklace designed by Phoebe Philo, but it might already be sold out by now. The categories I feel could still be improved are my rings and bracelets. In fact I only have one bracelet that I wear daily, my Maanesten Bourne chain, which I love for its unique texture and mix of colours. However I feel like I could have a bit more action on my wrist, but I need to find something that would go well with the bracelet I have already. In terms of rings, I wear my vintage ring daily and often add my Monica Vinader Amazonite ring on the other hand. I would really like to up my ring game, maybe by adding a simple band to double up the rings on a finger or maybe something unique but delicate. I’m still undecided about signet rings but I feel like they would look better on the pinky. What does your jewelry collection look like?